Alice and Julius have an adventure in Chinatown. Alice is captured by a jinn and is rescued by Julius in a madcap chase. As a rule I like all of the Alice Comedies, but some more than others. I rate my Alice Comedies accordingly, and many aspects are taken into consideration. Alice Chops the Suey is a non plotter. It begins by ripping off the usual "Out of the Inkwell" opening by having a human hand pull out Julius and Alice out of an inkwell (duh). The duo is then harassed for no apparent reason by a giant Mandarin Rat and his gang. 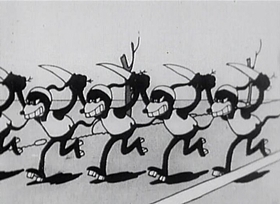 To save on compositing Alice into the cartoon, the movie has Julius hide Alice in a black bag which he carries for the remainder of the cartoon, most of which is spent outsmarting the Fu-Manchu-like hordes of rats. A definite low point in the series. Alright, so here again is the inconsistency that has plagued the Alice Comedies so far. It’s very tough to figure out, because the hallmark of Disney in the later years was consistency. Not every film would be your thing, but they all had good, entertaining qualities, and all had that Disney touch. Not so here, and that’s what is strange. Take the opening of this short, for example. 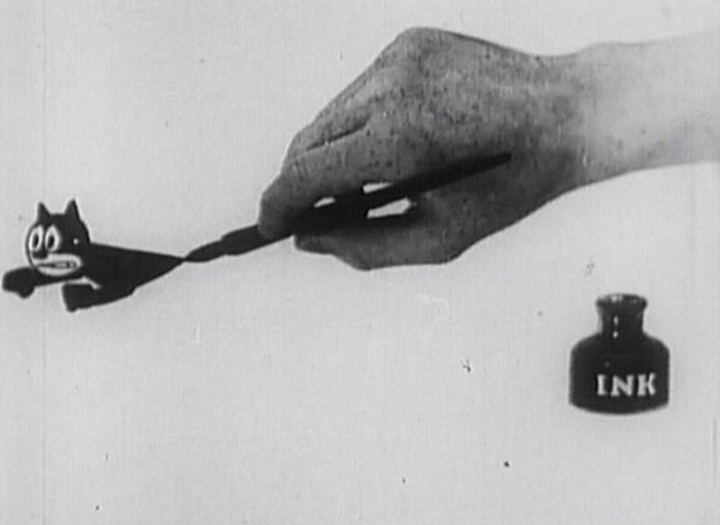 For some reason, even though this device is lifted straight from the “Out of the Inkwell” series, in Alice Chops the Suey, Julius and Alice are drawn from an inkwell by a hand. Huh? This has never been part of the series. All of the shorts so far have opened either straight into an animated sequence or featured a live action framing sequence where Alice enters the cartoon world. This is a completely out of left field development. It’s well done, no doubt, but it just seems odd. Worse, though, is not long after the two leads come out of the inkwell, the hand draws a stylized Chinese building, prompting Alice to exclaim that they must be in Chinatown. Based off one building? 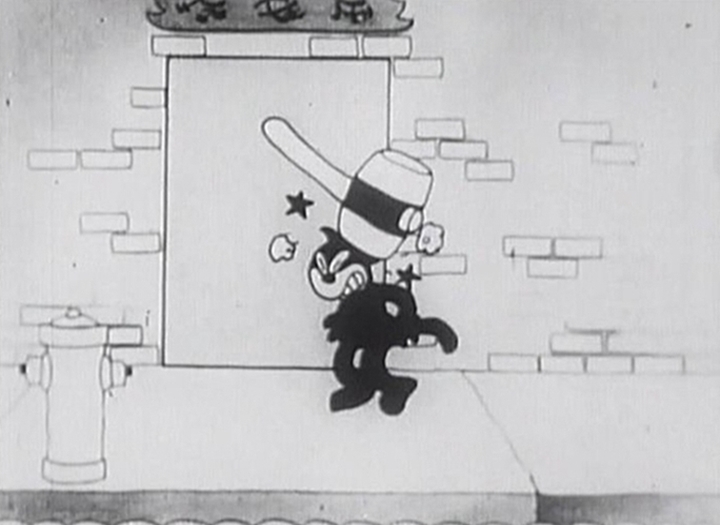 Anyway, right after that, a Chinese looking genie pops out of the inkwell and starts menacing our heroes. The genie tears the skin off of Julius, folds it into a bag and captures Alice, leaving Julius behind. Julius has to drink the ink in order to get his black color back, and goes to free Alice from the genie, who has inexplicably transformed into a mouse and is now hiding out. Julius manages to knock out a nearby mouse and steal his clothes to sneak in, grabbing Alice and running. The mice, of course, are hot on their tail, with the inevitable chase sequence. That is another example. 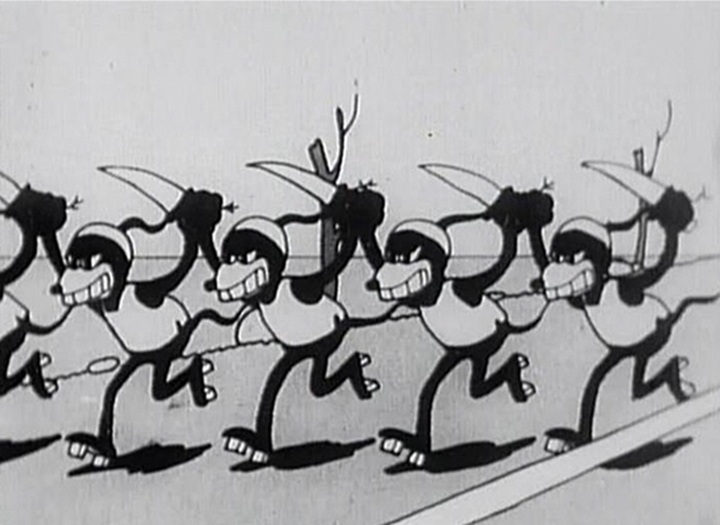 Almost all of the Alice cartoons has some kind of chase sequence, but many are better than others, and the ones that do not have it vary wildly as well. Regardless, this is the section where we get some good gags, which were mostly missing in the first part. Julius rides the bag with Alice like a circus ball, turns his tail into a propeller and flies and we see various formations of the mice attacking. 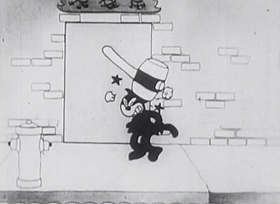 All are interesting gags, but none as good as what we saw in Alice the Jail Bird or even Alice’s Tin Pony. In fact, this film has some decent gags, but it’s not on par with the previous efforts. The whole thing ends when Julius catches swords that have been thrown at them by the mice then throws them right back, impaling the mice. He and Alice hit a tree, freeing Alice from the bag. Then, as the mice catch up, they dive right back into the inkwell to end the short. Frankly, it’s just a silly short, with lacking storytelling, simple animation and relatively poor gags. It’s not terrible, but it’s nowhere near the quality that was evident in the last two Alice shorts. So, my project now is to look at Walt’s life and what was going on in 1925 that might have caused this. I’ll have an update on that tomorrow.